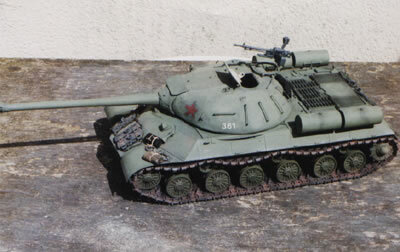 I Have never been a big fan of Russian Armour I suppose because any model of a Russian tank seems to be a bit basic and lacking in all those odds and ends that we modellers love to cover our tanks in, but having said that one Soviet tank that always took my fancy to build was the J.S.3., in all honesty I think it was because it was a complex looking and has a “bun” shape turret or at least half a bun! 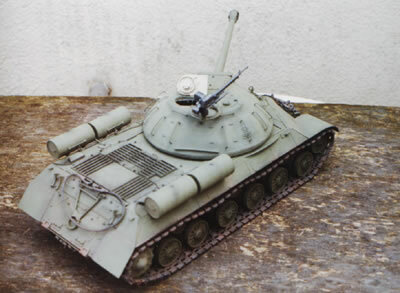 When I decided to have a go at one I Initially wanted to make the T.10 version which was longer and had an extra road wheel per side, but thanks to good old Tamiya they brought out the 1/35 scale model and I took the lazy way and scaled thier model up to 1/16. I started the model in the usual way by scaling the hull to 1/16 and making the whole piece in 60th card, I followed the same shape which meant making the axle station boxes seperately and fitting them on afterwards, when all these assemblies were complete and dry I drilled out the axle holes to 1/4 inch and around the openings fitted ready made discs from the plastruct range and on to these were glued bolt heads from 2mm hex rod. Ten of the twelve road wheel axles have a round drop centre instead of the more common square and these were made from 5/16 tube with inserts of 1/4 inch tube for stength, the tubes were then drilled at the tops and bottom at the correct distance apart and 1/8 inch tube inserted, when the small tubes were dry 3/16 and 1/4 inch pieces were added this gave me the final axle size. The next job was to make the mudguards which were from 20th card and because they were so thin it was quite easy to get the rounded fronts, I then made the inner pieces but did not fit them until later.I made the two long side top plates that run along the outer edge from 60th card and made four shaped wedges at the correct angle and glued two in each side up against the side plates. Profile Shot I made the rear lower and upper plates from 40th card and glued both of them on making sure all edges were flushed and then taped them in position and left the whole lot to dry overnight. The following day I made the glacis plate from two pieces of shaped cardboard and after some trial and error I eventually transferred them to 60th plastic card, I glued them in position leaving the edges quite rough until they were dry enough to sand to shape, I then glued two 20thx80th strips to the edge that joins the glacis to the mudguards. I made the top plate with the turret ring opening from 60th card and shaped it to the front and trimmed it off when dry, I made it short from the back and then added the engine deck to it with some edging strip around all sides, in the middle I 80thx80th strip in the outline of the engine grills and added 60×40 strip inside, lastly I added the various bolt heads. I next added the detailing to the rear plate making the round access panels from 20th card with hinges from strip and rod, the barrel lock is from 80th rod and 30th card and all the bolt heads are again from 2mm hex rod, front and rear tow hooks were made from two laminates of 60th card. I then checked around the model and added any of the previous forgotten parts including the fuel tanks which are from cut down steredent tubes and the whole thing was set aside to dry. The turret was something I’d been thinking about for some time during the rest of the build and finally decided to make a base plate copying the 1/35 scale model I then added two pieces of 60th card about an inch wide and a bit shorter than the overall height and glued them to the centre of the base plate, to the top of this I fitted a piece of card following the shape in the kit turret top and glued it on, all the measurements were made from the kit turret and I don’t suppose they are accurate, but at least I had a starter. I cut about 40 pieces of 60th card with a slightly rounded edge one side copying the kit shape as near as possible and glued them all from the top plate down to about 1/8 of an inch from the outside edge of the base plate, once these were all dry I added 20th card cut into about 3/8 inch strips and layed them around in the opposite way until it was almost all covered.